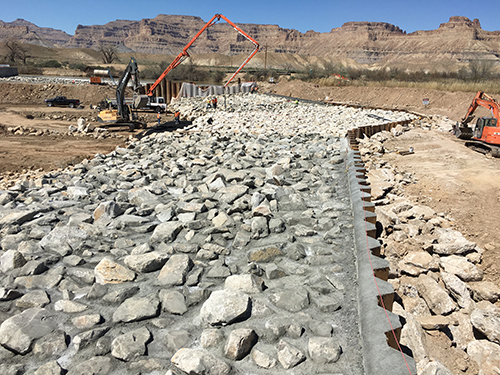 Bowen Collins & Associates (BC&A) completed design and construction management of the Green River / Tusher Diversion Emergency Watershed Protection (EWP) Project for the Utah Department of Agriculture and Food. The United States Department of Agricultures (USDA) Natural Resources Conservation Service (NRCS) administered the project through the Emergency Watershed Protection (EWP) Program. A new 880-foot long diversion dam was constructed to replace the original Tusher Diversion, a historic diversion dam that was originally constructed in 1913. The diversion dam provides irrigation water to canals on both sides of the river to more than 5,300 acres of farmland and diverts about 600 cubic feet per second (cfs) to an active power plant. High spring runoff flow in the Green River in 2011 caused extensive damage and heightened concerns of a catastrophic failure of the diversion dam that would result in significant losses to the local agricultural industry in Green River, Utah. The project design and construction schedule were accomplished in a very condensed time frame with design beginning in June 2015 and making water irrigation water deliveries by April 2016 and reaching final completion in June 2016. The new diversion dam was constructed of grouted riprap stair steps that dissipate energy in the water and prevent dangerous downstream recirculating hydraulics that are common with similar diversions. 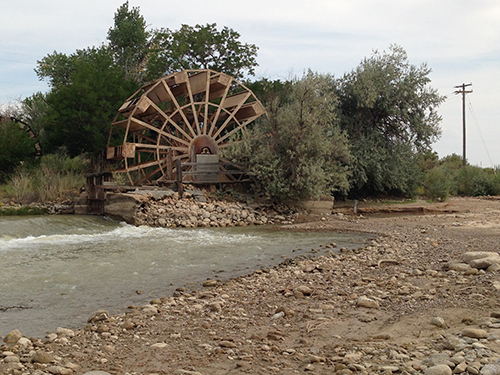 The new diversion dam includes a boat passage for recreational boaters, upstream fish passage, downstream fish passage, restoration of water delivery to a historic waterwheel, and improved sediment sluicing.